The goal: Creativity. The pathway: mastery of body, technique, partnership, and endless play. The dance floor, like life itself, is a playground of movement. With her home base in New York City, Flouer has an extensive, multilayered background in movement practices. Her experiences range from world travel for ice skating and contemporary dance, a lifetime of ballet, a decade of Latin ballroom & lindy hop, stage combat, burlesque, a smattering of zouk & WCS, and years of winning blues dance competitions. She has both her Undergraduate and Graduate degrees in Dance. Kelsey has been dancing since she was 5, starting with tap, jazz, and ballet, later adding lyrical, hip hop, and contemporary. She bounced around to different dance forms, from aerial to tango, lindy hop, and salsa, among others, until finding Brazilian Zouk, her drug of choice. She fell in love with Zouk when it was brought to Seattle by Xtine, and she has been dancing it nonstop ever since. Alex teaches Brazilian Zouk in Seattle and is excited to return to SFF this year. He enjoys sharing the creativity, flow, and musicality of zouk. By helping students develop an understanding of music, solo and partnering technique, and the nuances of our bodies, he hopes to guide people to a better partner dance experience. Warren Woo is a photographer, videographer, yoga instructor, trainer, choreographer, and dancer in the Seattle area. He graduated as a dance major at the University of Washington and actively participated as a dance student association officer, performer, and choreographer, along, with conducting honors research on dance partnering. Born in Hawaii and having to relocate often, he was homeschooled and studied music in his youth. His development as a physical mover began with Ultimate Frisbee, yoga, running and weight training in his late teens. He found his passion for dance in social partner dance and gradually found his way to ballet, contemporary and circus training over the years. Frequently collaborating with those in the area he has had the opportunity to present work at Converge Dance Festival, and perform at the UW, Full Tilt, Strictly Seattle, Men in Dance, Battle for the Dance Belt, and companies including the Cabiri, Karin Stevens Dance, Relay Dance Collective, Northwest Ballet Theater, and more. Robyn has been studying creative and athletic movement of many kinds since childhood. In high school she began to study yoga as a way to heal her body from chronic pain, help manage her emotional state and compliment her training as a cheerleader, dancer and athlete. She fell in love with the feeling she had after each yoga session, and wanted to teach yoga to spread the joy, health and clarity to the people she worked with. In 2013 she took her first 200 hour Vinyasa yoga teacher training in Seattle, WA. She taught in various places in Seattle, to both adults and children, and then later in Olympia, WA. In 2017, she traveled to India and studied Yoga Therapy with a master yogi, and completed another 300 hour Hatha yoga teacher training. Robyn studied Child development, Education and dance therapy for her Bachelors of Arts degree at The Evergreen State College, and during that time taught partner dancing and contact improvisation and yoga to elders, adults and children. Robyn’s teaching style is eclectic, stemming from Yoga, somatics, Qi gong, and many dance forms including the BrainDance, as she aims to give people more freedom in their bodies, and joy in their hearts through spreading mindful movement to all people. Teaching internationally for over a decade, Andrew still wears the same pair of dance shoes he bought after falling in love with social dance at the end of high school. In classes around the world, he draws upon his experience in social, vernacular, and classical dances to inspire and challenge his students. He brings a balanced focus to technique, body mechanics, spirit, and creativity and strives to create a positive, safe learning environment. Andrew continues to hone his skills through competitions and wins at events around the country, including Mean Old Blues, Rose City Blues (twice), and Portland Blues Experience (thrice). In his spare time, Andrew is a software engineer and holds a Master's degree in Sustainable Design and Construction from Stanford University. He enjoys hugs, yoga, and dark chocolate. Visit www.AndrewSmithDance.com for more info. Pongkhi Bujorbarua is a PhD candidate in Educational Psychology, UW, Seattle studying embodied learning and well-being through the arts. Since childhood, dance has been one of her primary languages of self-expression. Pongkhi began her training in the ancient Indian classical dance form of 'Bharat Natyam' at the age of 7, under Guru Indira P. P. Bora, in her hometown Guwahati in Assam, India. She performed her 'Arangetram' (graduation ceremony and solo debut) at the age of 15 years. Over the years, she has ventured into other dance forms, namely, Salsa, Ballet, Belly Dance, Hip Hop, and most recently, Brazilian Zouk. With 25+ years of dance experience between them Ryan and Jenny Sims from Seattle WA are practiced fusion dance instructors and performers. They blend a mix of ballet, hip hop, blues, swing, tango and more to create a unique style unto their own. Ryan started training and performing with the Olympic Ballet Theatre in 2010. In 2012 he started East Coast Swing which then led him to WCS, Blues and Fusion dancing. Jenny’s love of dance took off in 1999 when she discovered Hip Hop. In early 2013 she immersed herself in Latin, Blues, and Ballroom, which later lead her to Kizomba, Zouk, Fusion, Tango and WCS. Ryan and Jenny have been teaching together since 2015 and enjoy sharing their passion for dance with others. David began dancing tango in 2005 and hasn’t stopped since. He’s taken classes with Michelle y Joachim, Gabriel “El Huracán”, Luis Rojas, and Agustín Rojas y Sol Gabis, taking time to learn in Vancouver, BC, Washington, Oregon, and Buenos Aires. He began dancing blues fusion and then fusion in 2013. 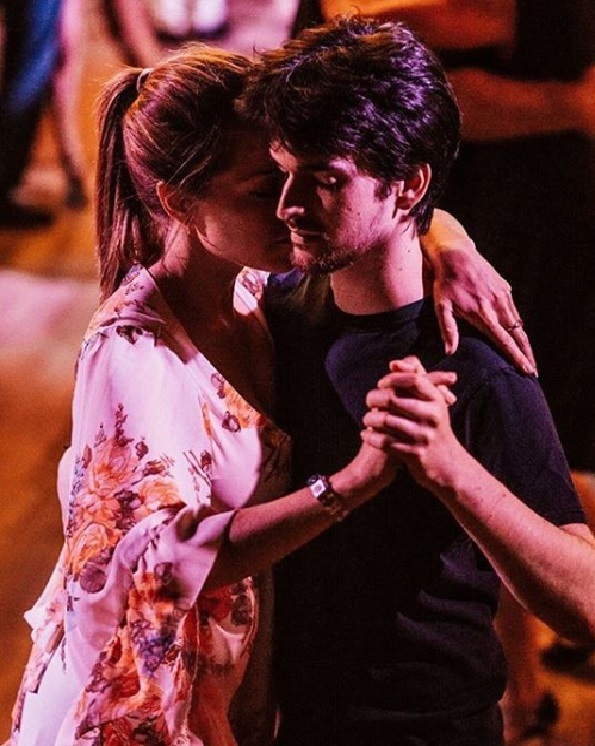 His goal in teaching is always to enhance the connection between partners and remind students that there is a joy to be had in dance that cannot be found anywhere else.